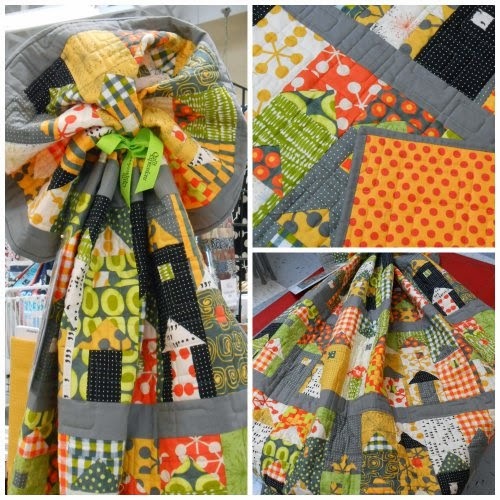 QUILT EXPRESSIONS: Featured Quilt Shop! 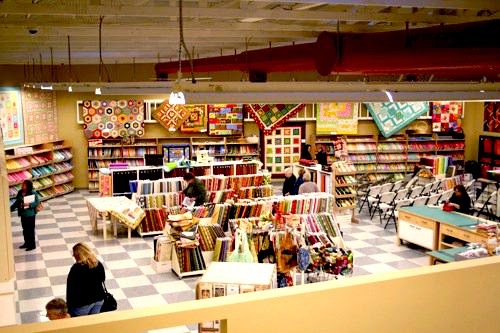 We had a fun time chatting with Karen, the owner, about her wonderful shop that was featured in Quilt Sampler Magazine this year as one of the TOP 10 shops in the United States! 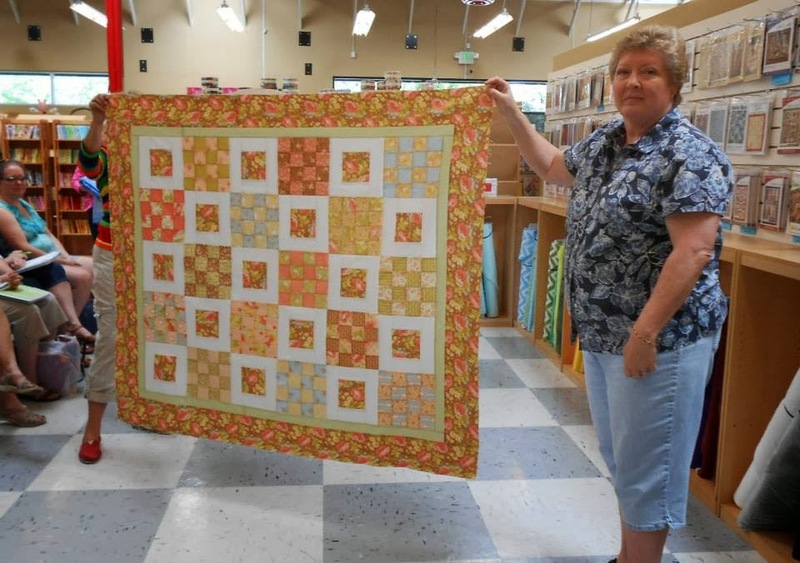 Quilt Expressions joins us today all the way from Garden City, Idaho. Square Ft: 6,600 square feet. Number of Employees: 10. Two are full-time, one is ¾ time who really works all the time behind the scenes, and seven part-time. Hours: M-F 10 to 5:30; Sat 10 to 4:30. Closed on Sundays. And of course our online store is open 24/7. 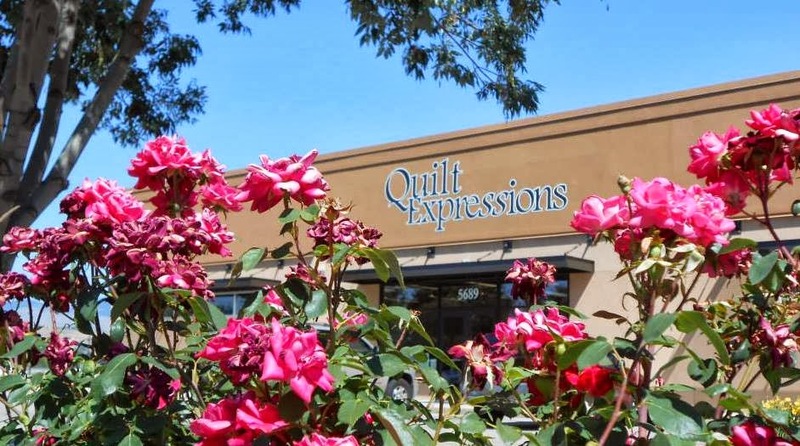 How the Shop Began: I purchased Quilt Expressions sometime in 2004 when it was an online only store. I had met the owner at a local quilt show and signed up for the email newsletter. A short time later, I got the news that she was closing for personal reasons. I called her up, went over to her house, and wrote her a check for 700 bolts of inventory, plus the website. THEN I called my husband and asked him if he could rent a truck to come and get my new inventory. He didn’t even flinch. After about six months of filling orders from my home, I decided I needed more social interaction, and I rented a storefront. We have moved three times as we’ve grown. The last move was three years ago into a building that I purchased. 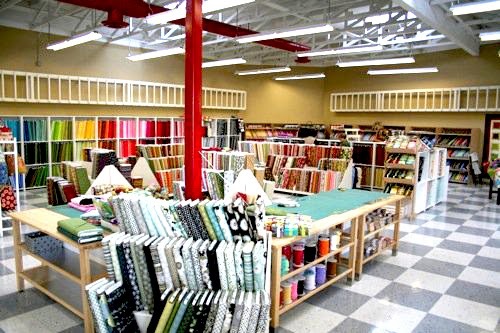 What differentiates us from other quilt stores? Our shop’s specialty is long arm quilting. We have five Gammill long arm machines in the store, four are available for rent and the fifth is a computerized Statler Stitcher. We provide quilting services but also teach classes on the hand-guided machines, then rent them out by the hour. 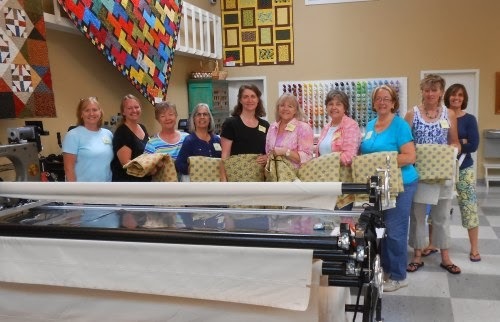 If I had to answer, “What is the one thing that makes us different?” it is that we make our customers successful, no matter what they are working on, or where they bought their fabric, pattern, or book. And that makes them happy. We run a Stashbuster club so every month we design a new pattern for our 120 members. It’s fun for us and them—so that is a lot of the show and tell that you see on our Facebook page. It’s really interesting to see one pattern made up in soooo many color schemes! We are constantly working to keep our store fresh, the samples inspiring and the stock orderly! 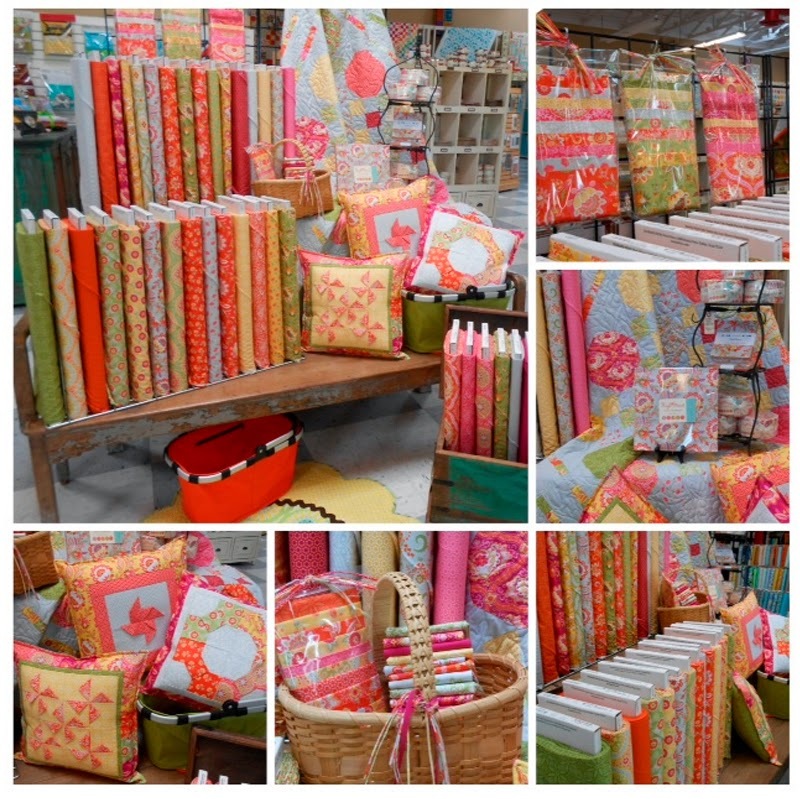 We have tons of samples, both of kits and patterns. What is our shop up to? 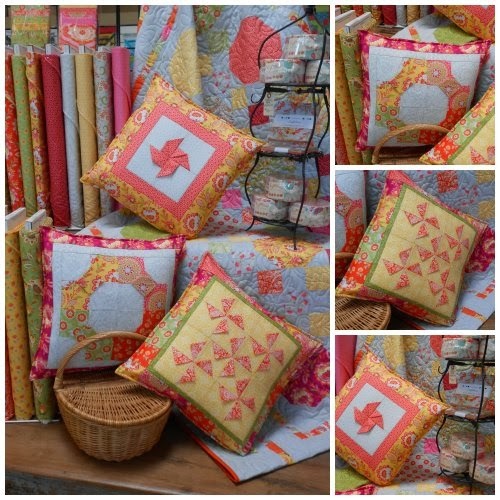 Katie has had a fun, daily question on the blog in honor of National Quilting Month. This weekend is our local quilt show, so we’re prettying up all of our displays. We host a monthly free seminar as well, and in October we will talk about wool. like this Easy as 1-2-3 Pillow pattern that we designed! By Sarah CastanedaIn Featured Quilt ShopTagged moda fabrics, Quilt Expressions, quilt shops6 Comments on QUILT EXPRESSIONS: Featured Quilt Shop! Previous Previous post: Layer Cakes and More! I live about 45 minutes away from here. It is a wonderful shop. I love going there!! Can you please relocate to the west coast of Florida? We have nice winters. LOL! I do all of my quilting here. This place is fantastic! Man – I would love to be able to rent time on a long arm machine! What an awesome resource! Wow. That shop sounds absolutely perfect. I wish I lived closer.